What Is The Thyroid And Why Do We Need It? Before we can discuss the disease of hypothyroidism, it is important to understand what the thyroid is and why you need it. 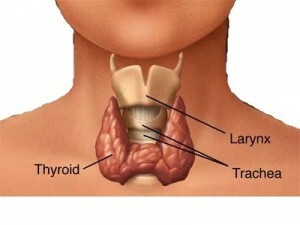 The thyroid is a small, butterfly shaped gland at the base of the front of your neck right in front of your windpipe. It is responsible for making hormones that control the way your body uses energy. What Is Hypothyroidism? Hypothyroidism is a condition in which the thyroid is underactive. It is not producing enough thyroid hormones to help your body use energy. This is not good and can lead to a number of health problems. What Causes Hypothyroidism? A number of issues can cause hypothyroidism, but if you are living in the United States and haven’t had any major recent bacterial or viral illnesses, thyroid surgeries, radioactive iodine therapy, or rare pituitary glad disorders, but suffer from hypothyroidism, you most likely have an autoimmune disorder called Hashimoto’s thyroiditis. It is a condition in which the body produces antibodies to the thyroid gland, over time destroying the tissues—the natural effect along the way is that the thyroid produces less and less thyroid hormones. You are more at risk for Hashimoto’s disease if it runs in your family or if you also suffer from diabetes or celiac disease. If you to have hypothyroidism, regardless of the cause, it is important to begin treatment before it is too late. Severe hypothyroidism can lead to an enlarged heart, heart failure, fluid around the lungs, or even a dangerous coma called Myxedema Coma. What Are Naturopathic Treatments For Hypothyroidism? Most western medical doctors simply prescribe some form of synthetic T3/T4 thyroid hormone to treat hypothyroidism. This can be effective but is not always necessary. I have found that not every person with hypothyroidism needs to this prescription although some do. After blood testing to determine whether or not a person has hypothyroidism as well as some testing to determine the cause, I then put my patients on a treatment plan. Often times simply a diet change and some herbal supplements or homeopathic remedies are all that a person needs to begin replacing the hormones lost by the hypothyroidism or healing the cause of the hypothyroidism as well. I always try and attempt to use the most natural means possible in healing a patient Sometimes, compounded pharmaceutical hormones like Armour Thyroid Naturethroid or compounded T3/T4 (two different types of thyroid hormone) are necessary and I can certainly prescribe those as well.